Back in the late 1960s, our East Texas school district made some interesting adjustments, or at least that’s how this third grader interpreted the situation. Instead of neighborhood elementary schools, the district divided the students up by grade instead of where they happened to live. Housing all of the third and fourth grade students in the former “black elementary school”, the transition from segregated to integrated schools happened without much fanfare. Because of the way my mother had raised me, I didn’t really think much of the change. What I didn’t realize is what was going on in that small town behind the scenes. A local eye doctor still had a “colored” waiting room, I discovered many years later. Although schools were integrated, some locals hung on to the old way of doing things. There was a world of discrimination that I never knew existed. You see, I never saw restrooms that were labeled for men, women, and colored or separate water fountains. I was unaware that any restaurants or department stores refused service to black customers. Being born in Houston late in 1960, I was alive during the turbulent times of Civil Rights reforms, yet I was ignorant of the plight of my fellow citizens. Once we moved to Louisiana in the early 1990s, I heard stories of separate black and white proms happening up until about ten years ago. Many private schools were started here as “white flight” schools. Shockingly, there are still unresolved federal desegregation court orders in local school districts. This was not the case for our East Texas school, since everyone had gone to school together beginning in elementary school. I never thought anything of having black teachers, many of whom were my favorites. In junior high, we had a black principal, who was one of the finest administrators I have ever known. To me, Dr. Martin Luther King’s dream had come true in our town. As I matured, I became aware of the depth of what my African-American friends and their families had been through even 100 years after the Civil War. Movies have been helpful in my Civil Rights education, especially The Help. Again, the history of what happened in Jackson, Mississippi was totally foreign to me. My very best friend had a black maid who fried the most delicious chicken I have ever tasted. There was no separate bathroom for her in the house. She seemed more like a young grandmother to me than hired help. Her color was irrelevant to how I felt about her. To think of white people making up stories about diseases black people carry, laws forbidding white people from associating with black people, or intentional means to prevent black people from their constitutionally guaranteed right to vote breaks my heart. Back in the fall of 1967, my father brought my mother, three-year old sister, six-month old brother, and me (six) to live with my grandmother, who survived on a small pension in a rent house owned by the company my grandfather worked for until he died. Raised poor herself, Mom and her sisters wore clothes made from flour sacks and could only afford to eat meat on Sundays. Marrying my father was a ticket out of that life, since he was a successful businessman in Houston, and Mom was able to stay home and take care of us until we got in his way. Mom tells of the times she washed out my socks every night and hung them to dry for school the next morning, but I never knew any better. She went to work as a ward secretary at the local hospital to help support us. Eventually, my father sent a measly $150 per month in child support. In humiliation, my mother was moved back to her home town with her three children and had to crawl her way out of poverty and despair, but we never knew we were poor. We weren’t black, but a divorcee and her children were considered to be undesirables. 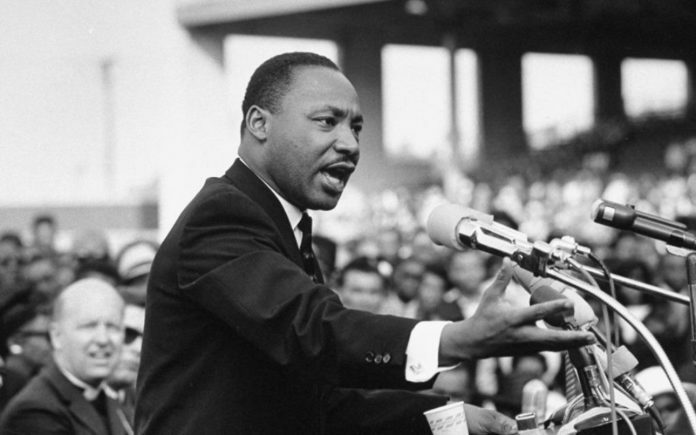 Watching the “I Have a Dream” speech from August 28, 1963, eloquently written by Dr. Martin Luther King, Jr. again, I am reminded that his non-violent approach to fight for Civil Rights was not in vain. Though many say his dream has not yet been realized, I can see much progress in the areas of equality, unity, freedom, and justice. Of course, I do understand that I may not be in a position to see the pain of their poverty or the despair of generations of hopelessness, yet I did experience some of both. What made the difference for a poor white family led by a single mother with a high school education? What could make the difference for a black family with similar circumstances? “God will make a way, when there seems to be no way, He works in ways we cannot see. He will make a way for me,” the Don Moen song says. Calling on the name of the Lord, listening to His voice, and obeying Him quickly is not the equation for a life lived happily ever after, but it will lead us on a journey of faith where we trust in God for everything we need. Having total dependence on God, now that’s where true freedom is found. For the most part, the legal barriers have been removed that King was willing to lay his life down to achieve. What are we doing with our lives to thank God for our freedom? The answer to that may just be the key to his and our dreams really coming true.